The Windham Middle School football team started its first-round playoff game against the Saco Junior Trojans exactly the way head coach Tony Leslie had planned. The Eagles marched down the field, with Treva Valliere, Grant Jacobson and Blake Houser running the ball behind strong blocking from an offensive line anchored by Blake Colby, Braxton Cassidy and Ricky Brichetto. To cap off the drive, Jacobson plowed his way into the end zone after catching a screen pass from quarterback Houser. With a little over three minutes left in the first quarter, the Eagles were up 6-0. Saco couldn’t move the ball on its first possession. The two teams traded offensive series without scoring and then the Trojans got on the board, tying the game 6-6 with 7:02 left in the second quarter. After taking the ensuing kickoff to the opponents’ 16-yard line, Houser connected with wide receiver Garrett Peeples on a spectacular catch in the end zone for a touchdown, but the officials took away the score on a questionable pass-interference call. Windham turned over the ball on downs and Saco took advantage with a halfback pass to take the lead 14-6 at the half. The Junior Trojans took the opening kickoff of the second half to the house and went up 20-6. Soon after, Peeples snagged an interception, but the Eagles couldn’t capitalize. Windham next forced Saco to punt, but the Junior Trojans recovered the kick on the Eagle’s 16-yard line and went up 32-6 with 1:17 left in the third quarter. The Eagles showed their heart and Houser knocked over defenders en route to a touchdown, bringing the score to 32-12. 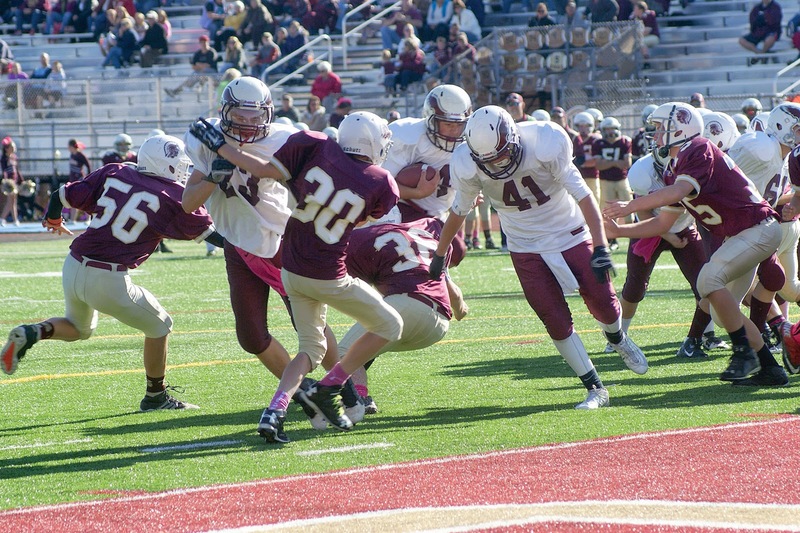 Then Windham was driving with 1:39 left in the game and Saco intercepted a Houser pass in the end zone. The game ended 32-12. Highlights from 2014 include the emergence of Houser as a promising quarterback prospect, while Jacobson and Valliere showed their value as dynamic two-way players. Peeples turned into a thrilling playmaker at wide receiver while Cassidy, Colby, Brichetto and Corbin Judy were unsung heroes on the line. Josh Mora showed potential at tight end and played virtually every position on defense. In the Portland game, who could forget Parker Varney’s lay out touchdown or Michael Fahey’s interception? For the seventh graders, quarterback Anthony Gugliuzza has proven himself as a leader and Noel Redlon and Mattingly Babb shone brightly as tight ends while Seth Wall and George Butts will be strong running threats every time they touch the ball next year. Treva Valliere (#23 in white) and Grant Jacobson (#41 white) make come crucial blocks to clear the way for Blake Houser (#14 white) to score against Saco. Photo by Eric Colby.